Deployment & management of Loco Pilots, Loco Shunters and Asstt. Loco Pilots for EMU trains, conventional passenger trains, Rajdhani & Duranto Express, Other Mail/Express Trains & Freight Trains hauled by Electric Locomotives. No. of EMU trains running in the Division – 801nos./day. Nos. of Mail/Express & Conventional Passenger trains running on Electric traction– 178 nos. /week. Scheduled and unscheduled maintenance of EMU Rakes at EMU car-sheds, outstation points and on line. Cleaning/washing of EMU rakes at the car-sheds and major outstation points which are manned by TRS staff round the clock. Trip inspection of Electric Locomotives at the trip sheds and attention of Electric Locomotives on line during unscheduled line failures/breakdowns. Two loco trip sheds are located at Narkeldanga and Chitpur. Three EMU car-sheds located atNarkeldanga,SonarpurandBarasatand another 4th EMU car-shed is under construction atRanaghat. Narkeldanga EMU Car-shedis the oldest car-shed which was commissioned in 1963 after conversion from steam shed and is catering to EMU services of SDAH (North) Section. In the same compound it is maintaining both Electric Locomotive & Electric Multiple Unit. Electric train started in SDAH on 23.11.1963. 9-coaches rake started at TRS/North in 1981. 9-coaches formation completed in 01.06.1992. Electric Shunter commissioned on 04.08.1990. HWH to SDAH EMUs service started on 03.04.2000. RHA to BNJ EMUs service started on 30.04.2001. PPGT EMU services introduced on 16.12.2001. Ticket Checking Special with Driving Trailer coach “CHETANA” commissioned on 13.03.2002. Twelve-car EMU Rake was introduced on 16.12.02. 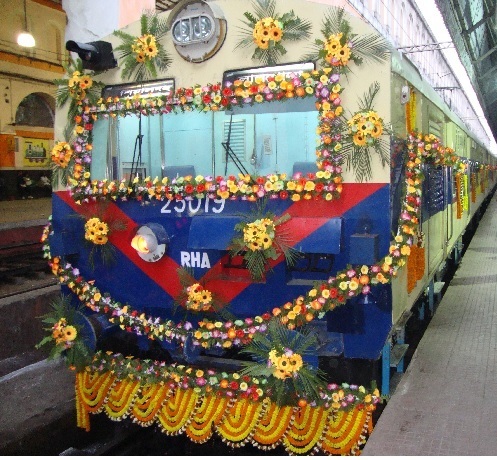 BT-HNB EMU service introduced on 23-12-2002. M/C No. 11266 has been renovated as Air Conditioned Inspection Car on 07.01.2010. Sonarpur Carshedstarted functioning on 13th August’, 1979. 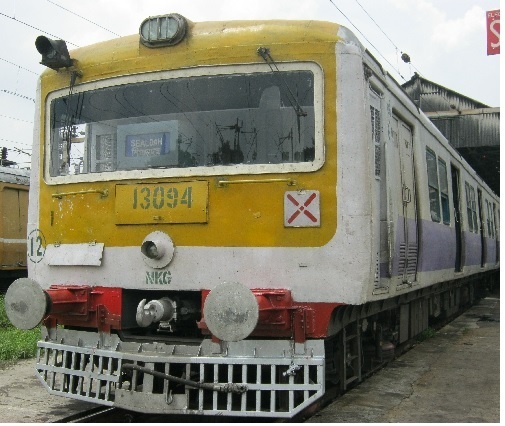 With the increasing demand of a Car shed at Sealdah South Section of E. Rly, this Car-shed was built with a view to look after the EMU rakes plying in south section of Sealdah division thus reducing the inconveniences faced by overburdened Narkeldanga Car-shed. Over aged M/C No. 10710 converted to battery operated shunting car. BARASAT CARSHED :was commissioned in 1990 to cater to the increased traffic requirement in BNJ section and electrified HNB and RHA-BNJ section. Barasat Steam Loco Shed site was selected during 1984. RANAGHAT CARSHED :was commissioned in 2007 to cater to the increased traffic requirement in in RHA-GXD, RHA-LGL, RHA-BNJ & RHA-STB-KNJ section including MEMU service in SDAH-LGL section. 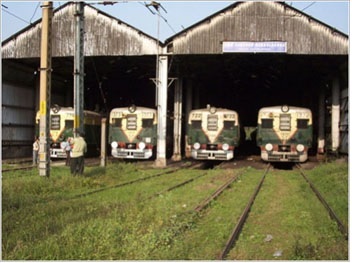 Capacity of the shed is 12 Car Rakes – 12 nos with two numbers of Inspection bay with elevated track. Present holding of the shed is – a) 12 Car EMU Rake – 5 nos, b) 9 Car EMU Rakes – 4 nos c) 8 Car MEMU Rakes – 06 nos. Ranaghat Steam Loco Shed site was selected during 2005. Apart from 3 Car-sheds EMU rakes are stabled during night at various out-station points. Mandatory inspection of daily night stabling rakes and dry sweeping are being carried out. First 9 Car Rake started from SDAH North. First Electric Shunter with Battery Power Pack was Commissioned at NKG. First 10-Car Rake Started From Sonarpur Car-Shed In SDAH South Section. Inauguration of Rajdhani Express from Sealdah. Ticket Checking Special “CHETNA” was inaugurated. 12 CarService was started In SDAH Main. First Air Suspension Rake was Introduced From Sonarpur Car-Shed. First Inspection Car at Narkeldanga Special was inaugurated. Mechanized Rake Washing through outside Agency was started. Construction of Ranaghat Car-shed was started. Inauguration of 12-Coach Rake, Maintained By Sonarpur Car- Shed, at SDAH-DH Section. First Introduction of 4-Coach Rake in SDAH-BNBA Section over Circular Railway. First Inauguration of Matribhumi local (Ladies Special)l from Kalyani to Dum Dum Jn. First Inauguration of Kolkata-Delhi Duranta Express from Sealadah. First Inauguration of two nos. MATRIBHUMILOCAL (Ladies Special) from CG to SDAH and BNJ to SDAH. Inauguration of New Inspection (AC) Car. Inauguration of SDAH-Amritsar Super Fast Exp. Augmentation of 4-car Bimanbander local to 9-car standard Formation. New MEMU Service in between KNJ-BPC section started. Incandescent bulbs have been replaced by tube lights in all the EMU rakes. Air Suspension EMU rakes have been introduced for increased passenger comfort through better riding and improved safety. These rakes have wider single piece driver’s look out glass, stainless steel grip handles and coach fittings. Construction work for creation of facilities for maintenance of 12 Coach EMU trains has been started at Sonarpur & Barasat Car-sheds. Coach washing activities at the EMU Car-sheds has been outsourced. In order to meet the heavy rush of passenger 12-car rakes has been introduced on and from 15th august’08. At present 327 numbers 12 car services are running. Six pairs of “Matribhumi Local” has been introduced in SDAH division to facilitate ladies passengers in peak hours. The maximum speed of EMU trains has been increased 96KMPH to achieve faster EMU services in SDAH division. LED base head code has been introduced in EMU rakes for better accessible of passenger’s information. To improve the cleaning of EMU rakes at outstation points Coach Cleaning has been started through outside agency at Sealdah North and South platform, NH, RHA, BNJ & DH out stations. To improve the ventilation of coaches additional 02 nos. fan have been fitted in the door way of EMU coaches. First time in Indian Railways One M/C No. 11266 has been renovated in the year 2010 as Air Conditioned Inspection Car for comfortable and hassle free inspection by VIPs. This air conditioned inspection car is provided with facilities of both ends driving, single big stone proof lookout glass, best interior and aesthetics, comfortable chairs, public address system, VIP Lounge with Sofas, ante-room with Bed, Toilet/Washroom, sound reducing features and other pantry facilities. All 12-Coach rakes of SDAH Division have been provided with LED display board containing indication of no. of coaches. To improve the punctuality of EMU trains during peak hours the DUAL KEY OPERATION has been introduced from 01-09- 2010. Prototype 9-car stainless steel rake no. 50041+50040+50039 of M/s. BEML make was received by Division on 10.06.2012. Commissioning work of this rake has already been completed at NKG EMU Car shed on 10.09.12. In house design, fabrication and installation of EMU training car for hands on training of Loco Pilot (Passenger) & Maintenance staffs. First time in Indian Railways Computerized, paperless, thumb impressionbased touch screen ‘Sign Safe System’ for suburban crew lobby was implemented at both SDAH South and SDAH North combined crew Lobby since 2004. 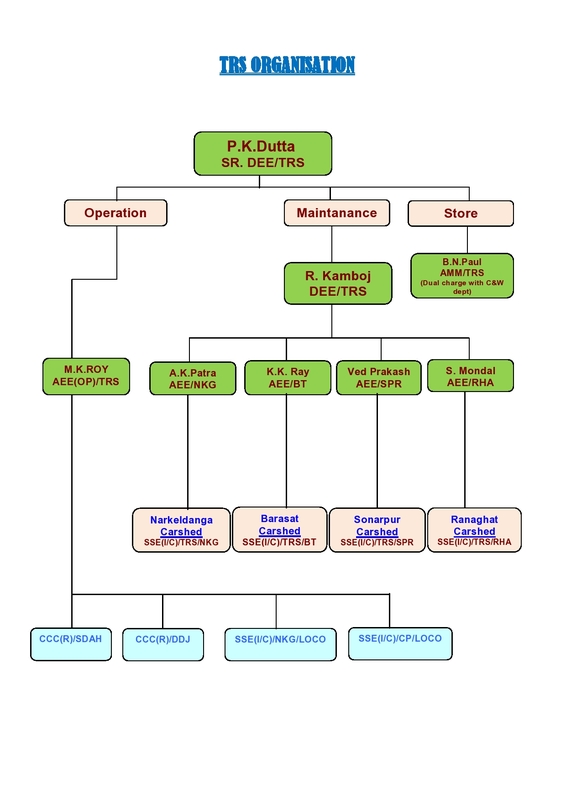 Further other crew lobbies of this division named Naihati, Ranaghat, Barasat is also provided with this system. In house developed data base application for the TLCorganization with feature of computerized charting of loco movement, recording / analyzing of loco detention ,crew utilization, daily TLC report, monthly TLC report, ‘Access’ on back end and Visual Basic at the front end was introduced since 2009. These two rest rooms have 27 and 17 beds respectively for the Crews of Mail/Express & EMU Suburban trains. Both Rest rooms are designed as two bedded cubicle, as per norms of Rail Board. Publication of quarterly Safety Bulletinof TRS/Operation consisting various Safety & Technical aspect on train operation with different messages was published since last one year. One Interactive SMS systemhas been developed utilising the existing database maintained by ‘Sign Safe’ system at CCC(R)/SDAH. Through this system duty roaster of LPM, LPP and ALP are sent to their CUG mobiles in advance. In case of any exigency the name and Bio data of the Driver of any train can be obtained by simply sending an SMS to this system round the clock. More over All Running staff are getting up to date information regarding their Leave, Bio data, Kilometre earning and Night Duty allowances by sending SMS to this system. All SLIs and LIs are also utilising the system for obtaining Bio data and availability of their Driver for foot plating and counselling purpose. The system is running satisfactorily since 2010. One bulk SMS delivery systemhas been developed and installed at TRS Control Room (TLC) for intimation of any line report, failure, safety messages/circulars and flash messages to all the Running Staff, Running Supervisors and Officers at a time in respect to requirement. 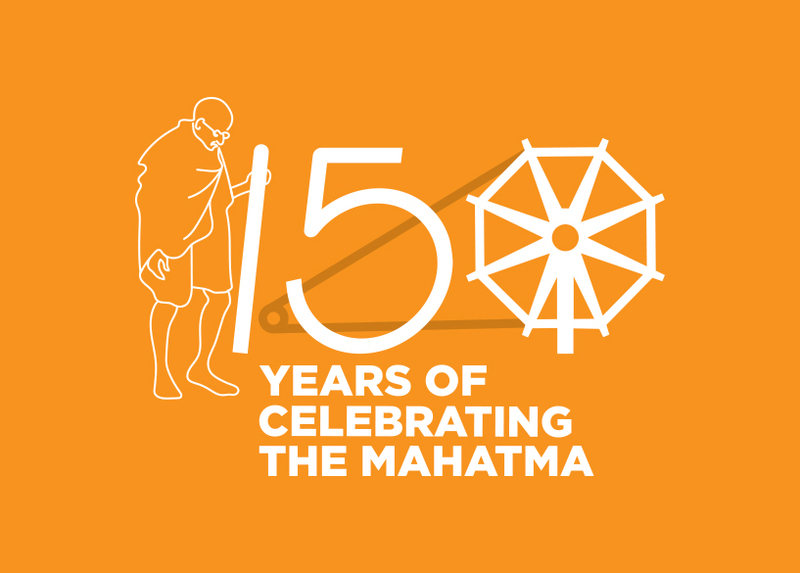 The same has been done with the existing departmental resource and it is running successfully since 2010. Signal Location Chart of all section in entire SDAH Division and the sections of ASN, HWH & DHN Divisions through which SDAH division crews worked, are made in coloured booklet form in which the ‘Right Handed’ and ‘Obstructed Signals’ have been high lighted and issued to all the Loco Pilots of this Division for their guidance in the year 2012. Subsidised Meal system has been introduced at Dumdum Running Room for the freight crews availing the Running Room along with cleaning & other house keeping activities since 2010. The quality of up keeping & cleanliness of this running room has been appreciated by the Higher Officials during their inspections.